Our second Business After Hours Mixer of 2015 was a wonderful celebration! The event was hosted by Falcon's Nest to mark their 1 year anniversary and they provided a wonderful sampling of their burgers and appetizers for the lucky guests! 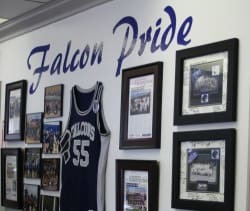 Falcon's Nest is a proud supporter and promoter of our local youth sports programs and the walls of the restaurant reflect their commitment. They are perhaps the first business in the mountain communities to really embark on a social entrepreneurship business model. As with all our events, the evening started informally as everyone arrived. Then the fun started! Self-introductions were made so everyone had an opportunity to share their business information, events, and upcoming fundraisers. Our hosts, James and Monica Tomlinson, were given cheers, applause, and appreciation from everyone on their accomplishments. James shared his thoughts on their first year, and their business model. He emphasized the importance of providing employment (Falcon's Nest hires local high school students), opportunities, and support for the area's youth programs. James also spoke about businesses helping each other, and how grateful he was for other local business owners that have been supportive. He also mentioned that the local economy seems to be picking up, and we're all happy to hear that! James and Monica's passion and enthusiasm in their business is contagious. We can't wait to work with them on some great ideas! In a strange twist, there was a bounty of donated raffle gifts and some people won two prizes! Many thanks to the businesses who donated so generously! Jean Miller (Cottage Garden) won a gift basket donated by California Bank & Trust. Curt Gibson (Hall Ambulance) won a gift certificate to Sue's Tavern. Annette Ross (Stow Away Storage) won a gift certificate to Falcon's Nest. Robin Willoughby (Mountain Day Spa) won a gift certificate and a living herb basket donated by the Cottage Garden. Nikki Albertson (Jim's Towing Service) won a soothing sound machine and a USB drive donated by Computers and Games. Thank you to everyone who came out, it was wonderful to see some new faces! Be sure to check out our Facebook page for more event photos. If you don't see a picture of yourself at the event, I apologize. It seems that I took several photos of people while they were in mid-bite or mid-conversation and you would thank me for not posting those. Next time, we need to gather people together for slightly less candid shots. Our next Business After Hours Mixer is July 16th at Shelter on the Hill in Lebec. Please visit this wonderful animal shelter and see a training demonstration by the current shelter pups! Our first Business After Hours Mixer of 2015 was a ton of fun! The event was co-hosted by Relay for Life of the Mountain Communities and California Bank and Trust, with food provided by Denny's and Flying J. 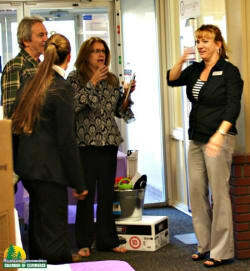 The bank branch was livened up with beautiful purple ribbons and balloons by the Relay for Life Team. 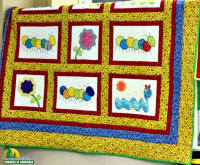 On display were several raffle prizes, such as the handmade quilt pictured here. Proceeds are being donated to the American Cancer Society research and patient support funds. Tickets are being sold now for the raffles and several businesses around town have prize baskets and tickets available. The evening started casually as guests started to arrive and enjoy the refreshments. Self-introductions were made so everyone had an opportunity to share their business information and any upcoming special events or anniversaries. 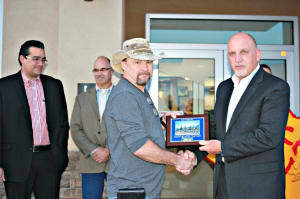 ACE / Frazier Park Lumber and Hardwareis marking their 40th anniversary. Chatterpillar Toys, Gifts and Balloonshas hung on for 11 years through "economic downturn, floods, plagues, and break-ins" as owner Peter Bogdnaoff joked. Computers and Gameswill be celebrating their 5th anniversary in July. Bonnie Kane of the Ridge Route Communities Historical Society & Museum reminded us that this is the 100th anniversary of the opening of the Ridge Route Highway and several celebratory events are happening during the year. June Schmidt, the Event Lead shared how important the American Cancer Society was to her, and how much help and support she received while undergoing cancer treatment. This first hand experience is what drives her passion for the annual Relay for Life fundraising event. Many volunteers of Relay for Life enthusiastically relayed (pun intended) information about their upcoming individual team fundraisers so we'll all be on the lookout for those dates and locations. You can also stay up to date on activities through their Facebook page, or sign up to be on a Relay team here. 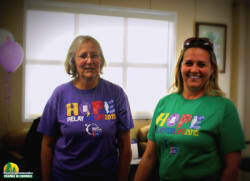 Donna Hermann, Event Specialist of Relay for Life made special note about the success of the volunteer team. Karen Schott echoed that by pointing out that raising almost $30,000 in a community of about 10,000 residents was quite extraordinary and she feels it really speaks to the generosity of our community. The 3rd Annual Relay for Life of Mountain Communities takes place on June 6 - 7th, with the opening ceremonies starting at 10:00 am. We're all looking forward to it! Vice President, branch manager Sherri Dumin gave a quick update. Property values are (finally) edging up and the bank has an excellent home credit line available at 2.75% fixed rate interest for the first 6 months. Anyone who is interested should stop in to the branch to get more information. The fun continued with several prize drawings. Many thanks to the businesses who donated! Robin Willoughby (Mountain Day Spa) won the prize that everyone had their eye on - a collection of six bottles of wine and sparkling champagne from California Bank & Trust. Our surprise visitor of the night was Ryan Shultz, Field Representative for 4th District Supervisor David Couch. He came straight from a meeting in Bakersfield and gave a quick update on the library privatization issue and cross-county green waste dumping. Ryan answered many questions from other guests about other issues including water and solar energy. He spent additional time after the event with me (Rachel) to make sure that my recent questions about the Frazier Park Streetscape and Lebec Visitor's Kiosk had been answered. Thank you to everyone who came out - we hope you had a great time. Be sure to check out our Facebook page for more event photos! 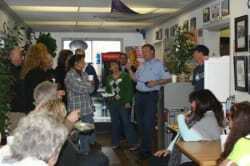 Our next Business After Hours Mixer is May 14th at Falcon's Nest in Frazier Park. Help us celebrate their 1 year anniversary! 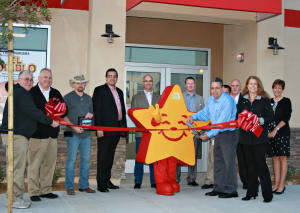 Grand Opening at Carl's Jr.
We were very proud to host the ribbon cutting today for the brand new Carl's Jr. location at 5631 Laval Road in Lebec (right by the Tejon Outlets). The festivities kicked off just prior to 6 am because the first 50 guests to arrive received a coupon booklet good for a year of free food! The Carl's Jr. team kept their early guests nice and warm with some complimentary coffee as they waited in line for the official opening. As the restaurant opened, breakfast was served! One guest remarked that she was thrilled with the handicapped accessibility of the restaurant, especially the soda fountain that she was able to reach with no difficulty. ....and Chamber President Scott Parsons presented the membership plaque to David Burke, Senior Vice President of Operations for Region 6. 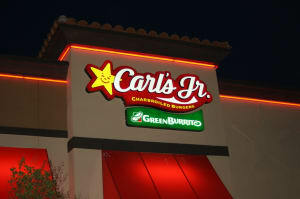 Welcome our newest member Carl's Jr.! First, a big THANK YOU to our members Denny's and Pilot/Flying J for providing the meeting space and a wonderful assortment of food and drinks for everyone to enjoy. Several members attended with representatives from Relay for Life of the Mountain Communities (June Schmidt), Mountain Auto Body (Moses and Brenda Gameros), Stowaway Storage (Annette Ross), Ridge Route Communities Museum (Bonnie Kane), Tejon Mountain Village (Bret Schumacher), general contractor Gregg Mechelin, and marriage and family therapist Christine Buma. The meeting started with a welcome and an announcement that this is start of the Mountain Communities Chamber of Commerce 19th year serving the community. Self introductions were made and all board members were introduced. An announcement regarding a board member vacancy was made. Update: We are pleased to report that the vacancy has since been filled and our newest board member will be introduced soon. 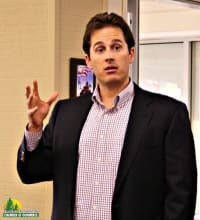 Board president Scott Parsons made the announcement that the board will hold open meetings every other month to allow time for members to bring their questions, concerns, and ideas to the board in person. The next open meeting is scheduled for May 28th at 6:30 p.m. and will be held in Lebec. Meeting room location to be announced. An open discussion took place regarding the direction and goals of the Chamber of Commerce going forward, an intro to the subject of cultural tourism, and feedback on the newsletter. Everyone in attendance expressed their appreciation for the progress that the Chamber of Commerce has made. The board of directors was encouraged to continue with the current path of promoting our members, offering resources, and supporting other groups events rather than putting on our own events. If members are interested in the topic of cultural tourism, they are encouraged to contact board member Shelia Clark. Shelia will head a cultural tourism committee if there are enough interested participants. An update was given regarding an increase in the base membership rate. It is the board of directors responsibility to manage the Chamber of Commerce in a fiscally appropriate manner. As such, the base membership rate was raised from $75 to $100 annually, with the goal of establishing a reserve fund for larger recurring purchases such as membership plaques, and to allow the start of advertising in regional publications. Bonnie Kane pointed out that Kern County Board of Trade grants could help with advertising expenses and offered to assist with the grant application. Updates were given on upcoming mixer and grand opening dates, The Coming of Asphalt project, and outreach to the Kern County Board of Trade (regarding their website, visitors guide and visitors kiosk). Other announcements were made regarding additional signage possibly becoming available in Lebec at the Flying J property, as well as a meeting room. A proposal was made to establish a "Get Shredded Day" and bring in a mobile document shredding service one or twice a year. All in attendance felt it was a good idea, and the board of directors voted to move ahead. Board member Rachel Unell will start the groundwork for this project. Members also gave updates on their own businesses and important dates/events. It was wonderful to hear how many fun and fantastic things are taking shape in our communities! We look forward to highlighting all those projects in upcoming news. Other general updates were provided regarding Chamber administrative business. The meeting adjourned at 7:30 pm. April 15th- Joint mixer with California Bank & Trust (CB&T) and Relay for Life of the Mountain Communities. Location will be at the CB&T branch in Frazier Park on San Carlos Trail. The fun starts at 5:30 pm. All are welcome to attend. 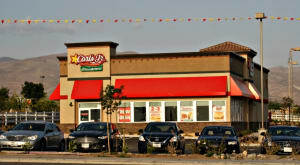 April 21st- (Date and time are still tentative pending permit issues)Grand Opening of Carl's Jr. in Lebec at Laval Road.